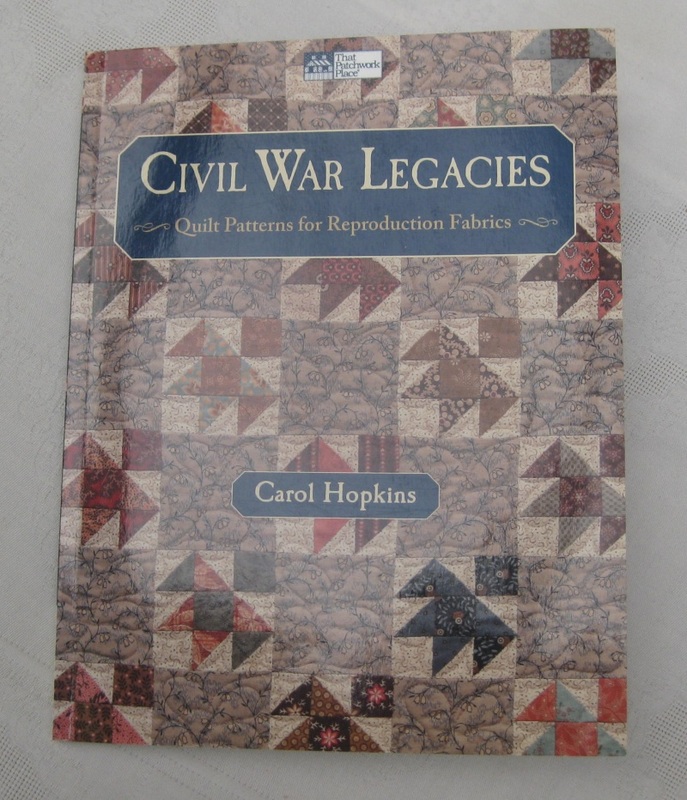 Now that I’ve finished the patchwork top of my American Civil war quilt, I can put together the layers, and do the quilting. 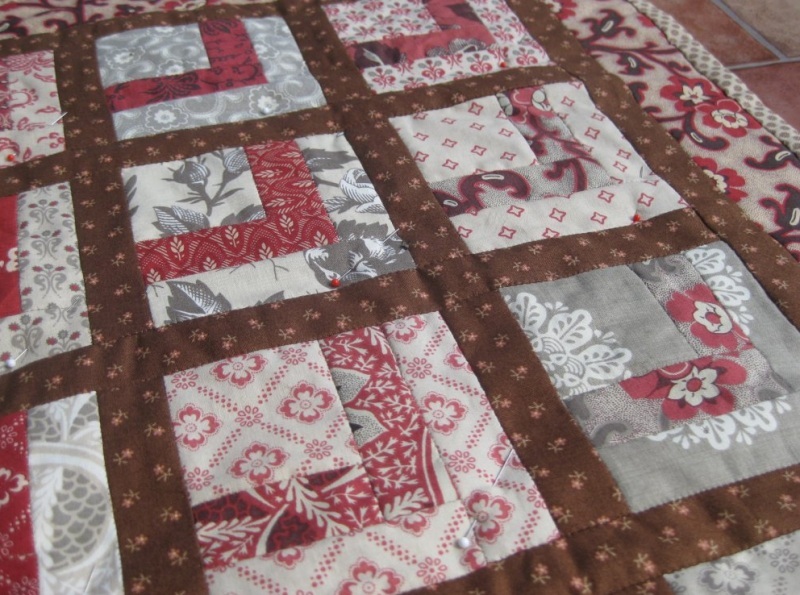 With big quilts, this stage can be difficult, as you need a lot of space to spread out the fabrics. 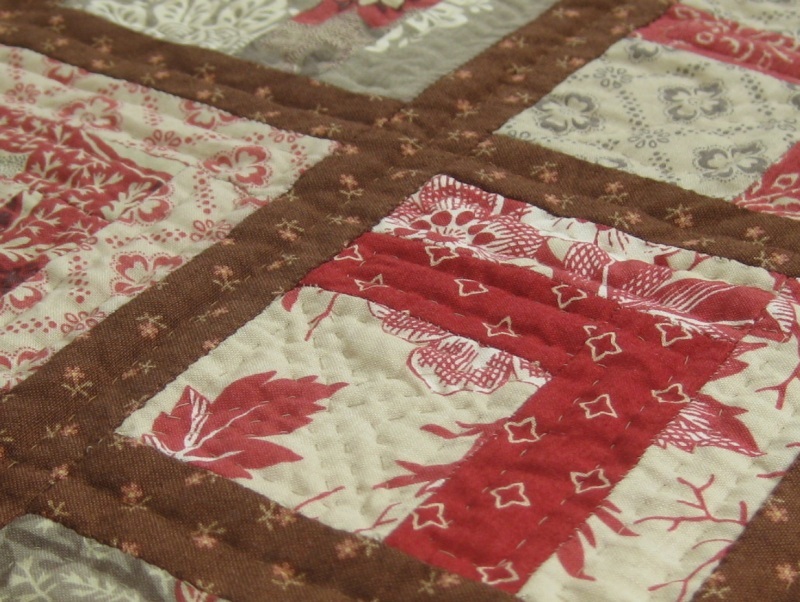 My quilt is only 22 by 27 inches, so it’s not a problem! I did mine on the floor in my conservatory! I put the backing fabric down first, wrong side up, then spread out the wadding (100% cotton heirloom wadding), then the ironed quilt top. Making sure there were no creases in the three layers, I put pins in every four inches or so over the top of the quilt to hold it all together. 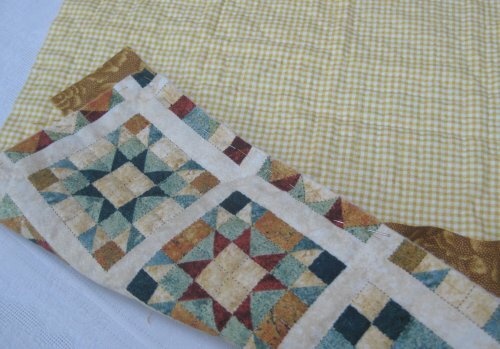 Then, with sewing cotton I made a grid of long tacking stitches over the whole of the quilt, with about three inches between rows, starting in the centre and working out to the edges. As my quilt is small, I put the binding on at this point. 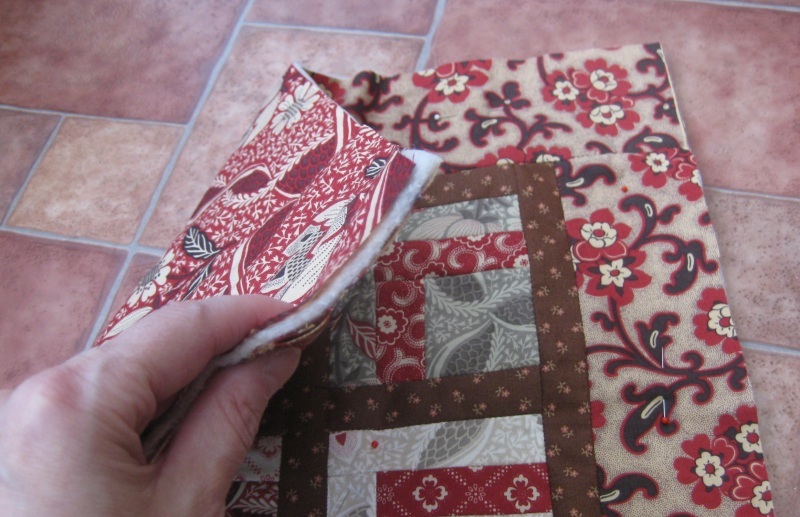 If you make big quilts, you’d probably think I’m daft to do this, but I find that it works! The layers don’t shift much with a small quilt, so I can get away with it. 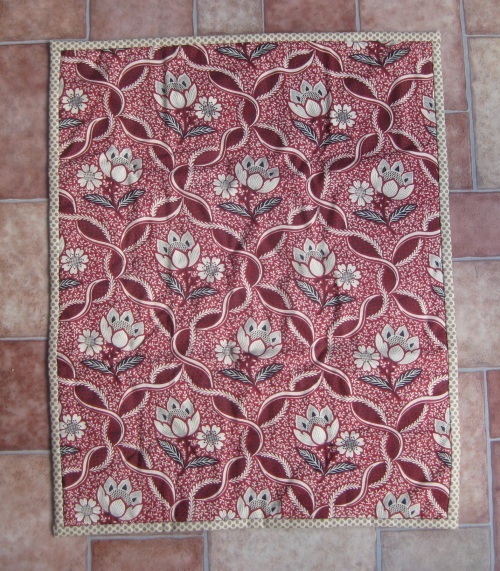 This is the back of the quilt – gorgeous fabric, isn’t it? 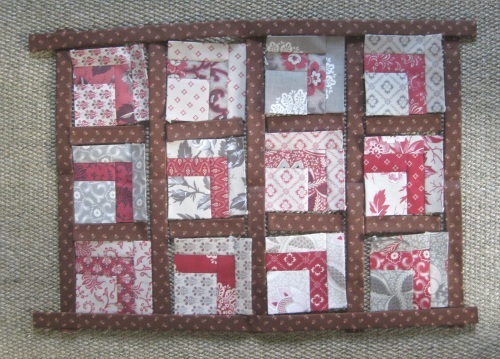 I put a few extra pins in to keep the layers together, and started quilting – by hand, with polyester thread. 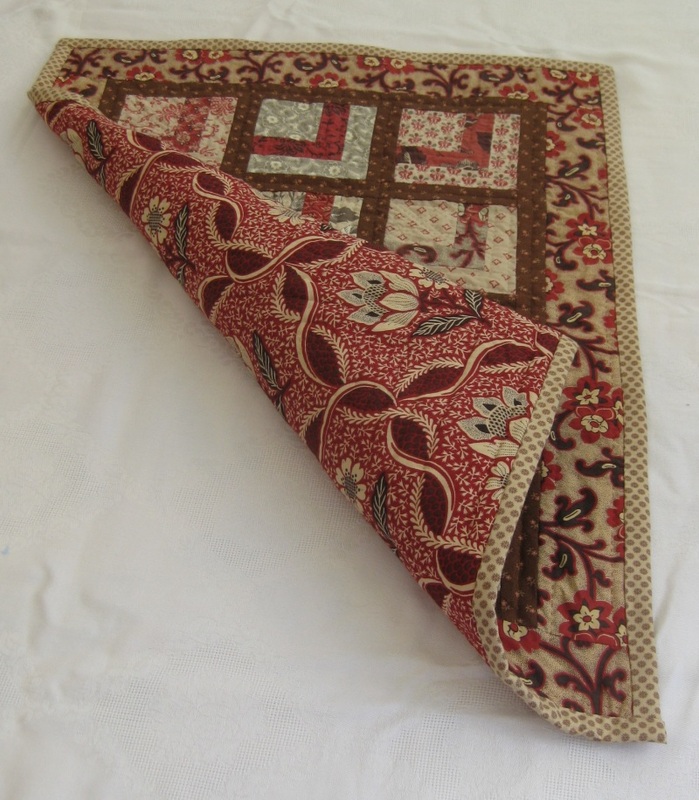 I didn’t use a pattern for this one – I just echoed the edges of the pattern pieces. 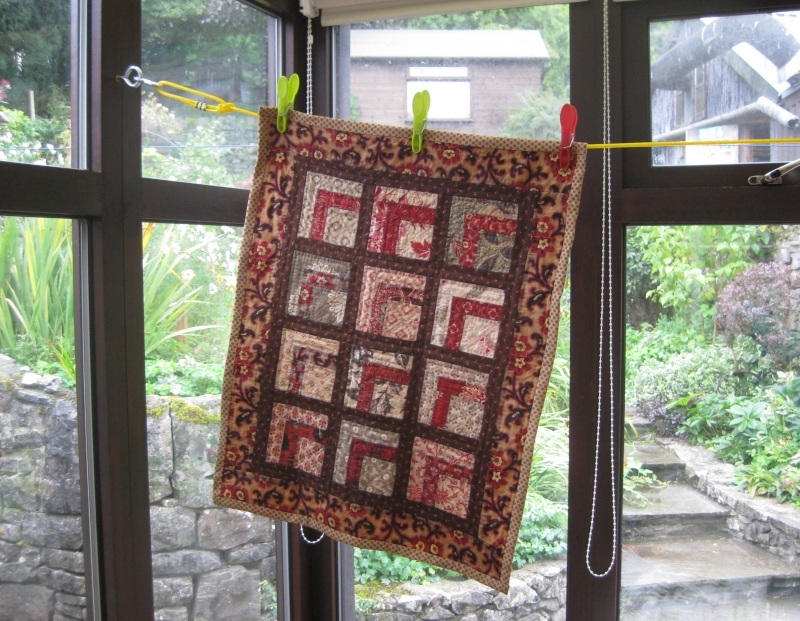 When all the quilting was done, I washed the quilt, and hung it up to dry in the conservatory, so that it started to have that old-fashioned crinkly look. 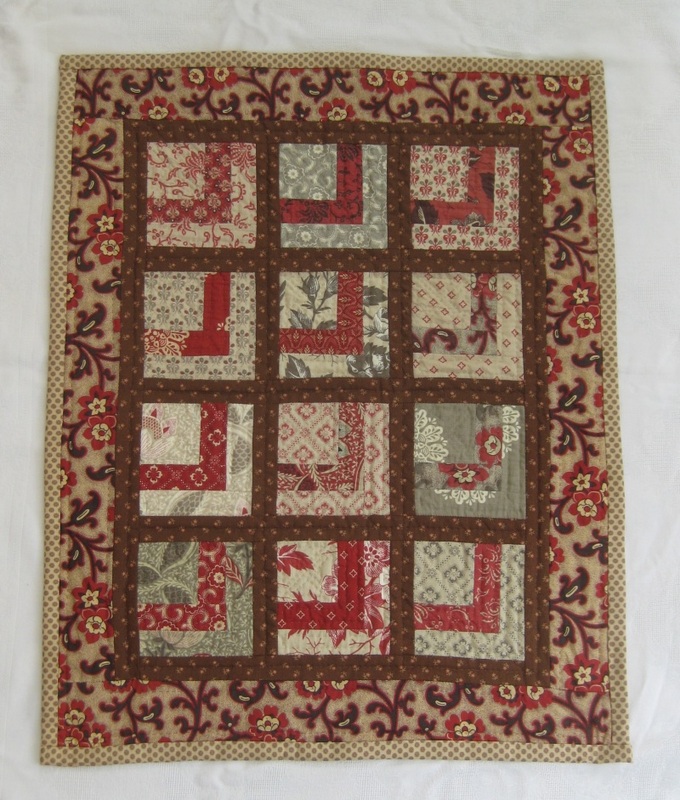 This is the finished quilt – it measures 21 by 25 inches. It has ended up looking quite different from the way I thought it would. And very different from the example in Carol Hopkins’ book. But I like mine, with more red in it than the example that I started out wanting to copy. As usual, I’m not totally happy with my stitching – I wish I could get my stitches smaller and more even, but it’s quite a bit better than my previous quilt, so I’m getting there slowly! 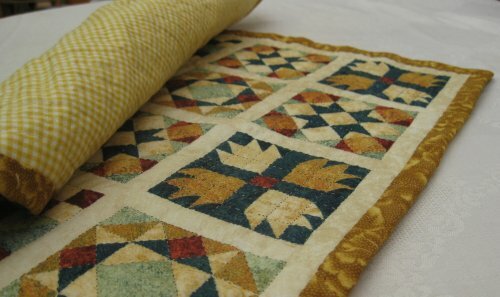 I use my little quilts as mats around the house, and as covers for side tables – anything that looks a bit bare, really! And as soon as I’ve finished one, I want to start another one….! Once I’ve cut out the pattern pieces, based on the measured papers that I made before, I can arrange them on the reverse of the fabric from the charm pack pieces. 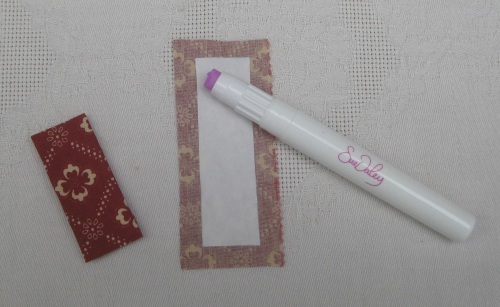 I use a tiny bit of glue from a special glue pen to hold the paper in place on the fabric while I cut it out. These glue pens are wonderful – they are from the Sue Daley range, made specially for patchwork. The glue is pink in the stick, but when it dries, it dries clear. So you can see where you’re putting it, but it doesn’t mark the fabric permanently pink. You can get refills easily, too. It helps to keep it in the fridge till you’re ready to use it, as if it is at room temperature, it’s a bit soft, and you end up using more than you need to. As my quilt is only little, I cut all my pieces out with scissors. If I had hundreds to do, I’d use a rotary blade and a cutting mat. I make my seam allowances about a centimetre, rather than the recommended quarter of an inch, as it makes it easier to get accurate folds on the seams, as I’ve got more to get hold of. 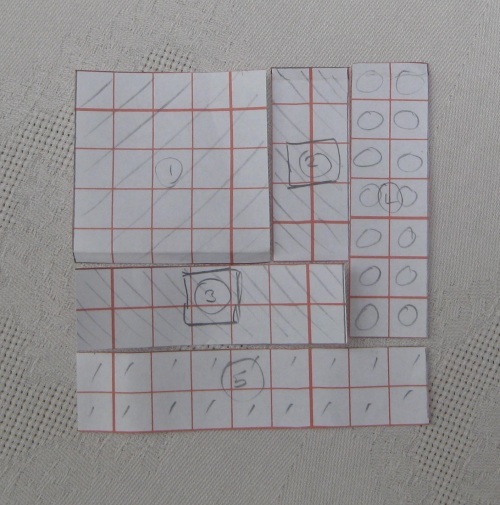 I put a line of glue on the paper, then fold the fabric over and press it in place. The glue dries really fast. I just fold each side over (not mitreing corners or anything) going round the shape until all four are done. This is one block, ready to be stitched together by hand. 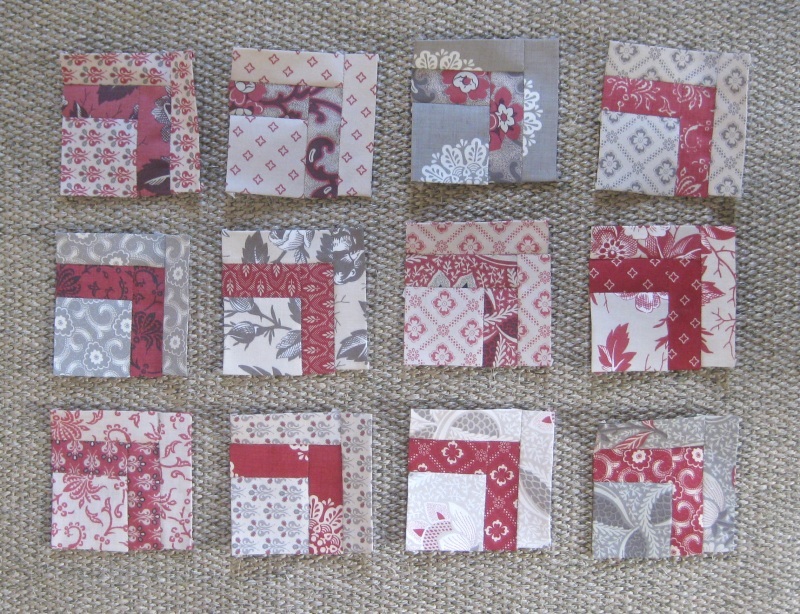 Here’s the twelve blocks, once I’d stitched them all together. 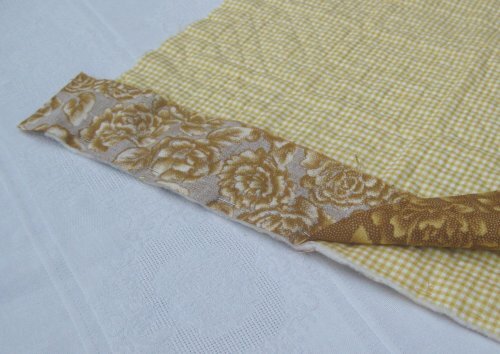 I use polyester thread, in a neutral tone, and just oversew the pieces together. 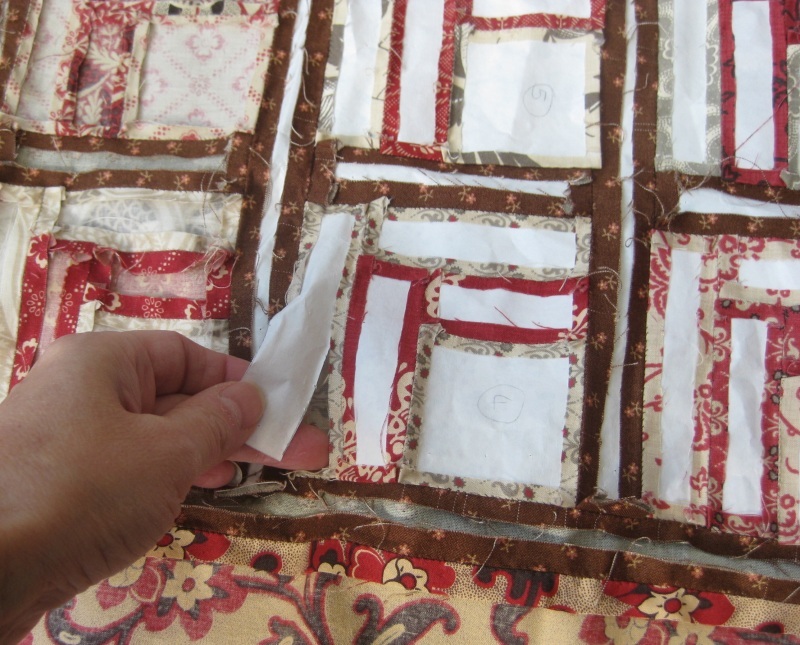 The sashing pieces (joining strips) are made in the same way – by glueing the fabric over long strips – except that I made these intentionally longer than they needed to be, to give me ‘wiggle room’ when stitching them to the other blocks. 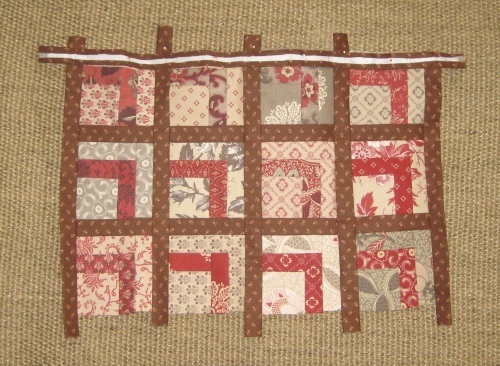 Each long strip is pinned in place, and then oversewn to the main part, right sides together. It’s tempting at this point to remove all the papers from the back, but it helps to have the main area still quite stiff with the papers in, while I’m adding the wide borders. 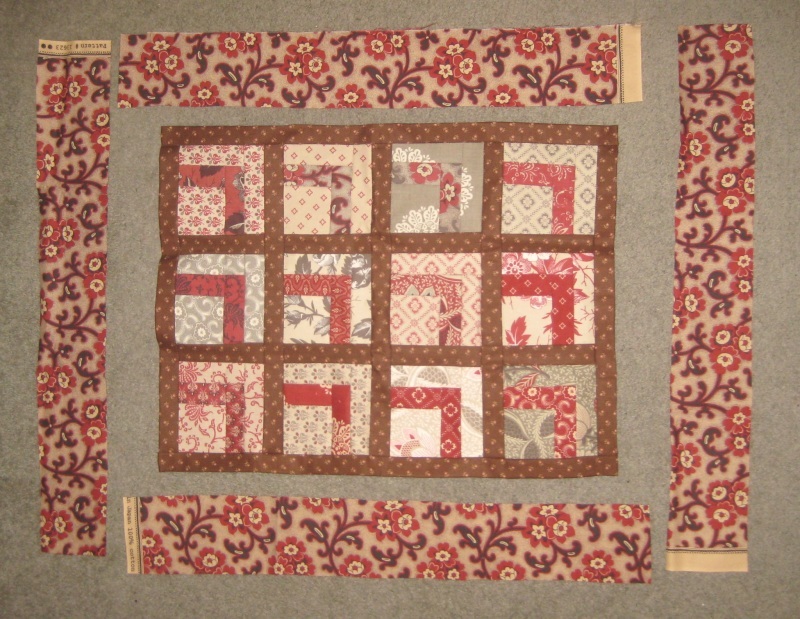 The long border pieces are added first, then the short ones. 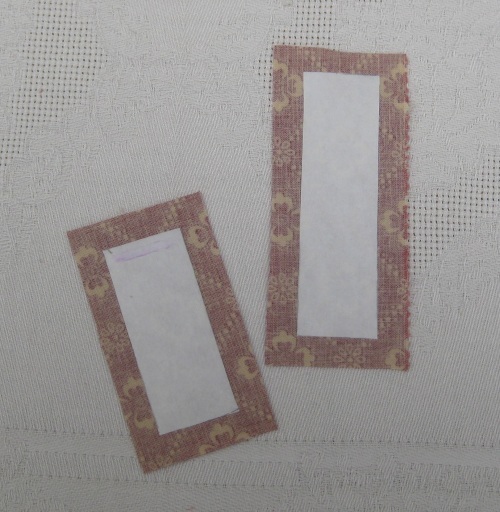 I didn’t mount these wide borders on paper first – I just turned a narrow seam allowance and pressed it in place, then oversewed the edge to the edge of the dark brown strip. This is the bit I look forward to! Taking out the papers! 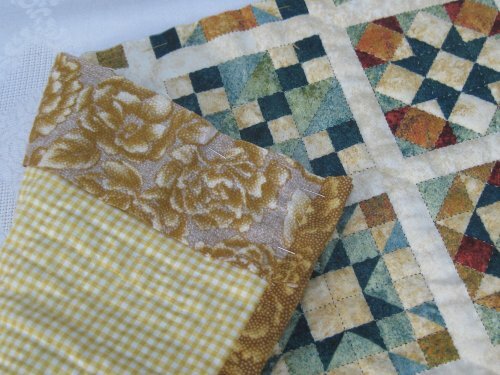 Suddenly, the quilt goes from being lots of stiff little bits of fabric, to one soft and flexible quilt top, that has become something different in the process. 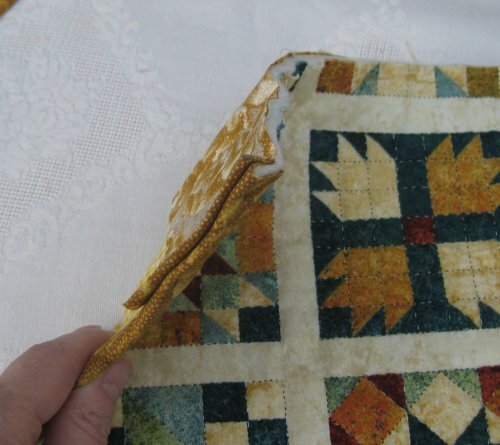 Unlike a quilt made by machine, the seam allowances aren’t pressed over to one side – they are left open like this. Later, the whole quilt top will be pressed before being layered with the wadding and backing. 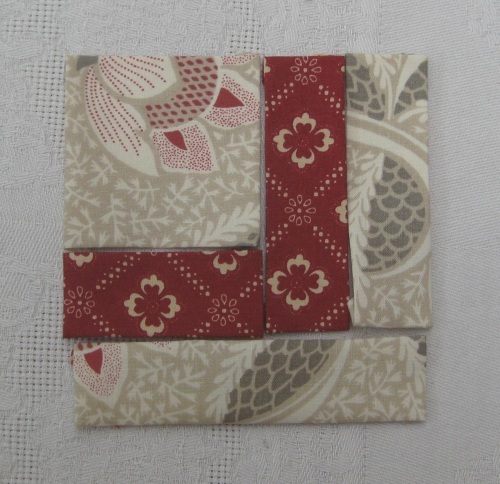 Apart from doing loads of embroidery all the time, I am starting to make little quilts. 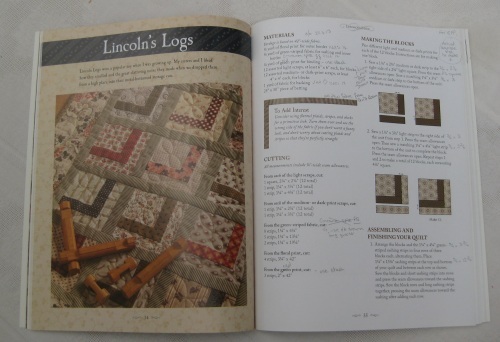 I don’t make large ones, as I don’t have the space, but I thought I’d do a few blog posts about how to make an American Civil War quilt using English paper piecing, as that’s the method I like to use. Even then, I adapt it to suit the way I like to make them! It’s quite simple, and doesn’t have any triangles in it!! 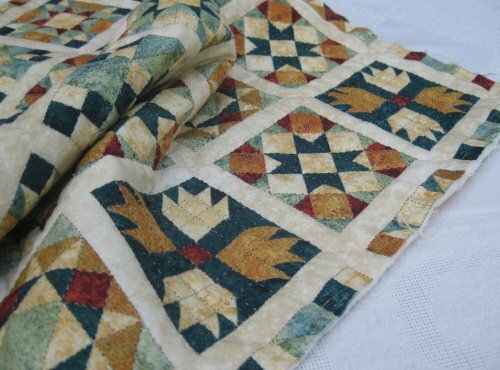 The first quilt I made had loads, and I kept getting the seam allowances wrong, and cutting off the tips of the triangles as I stitched the seams 😦 That’s when I decided that machine piecing maybe wasn’t for me, and English paper piecing might be more accurate. 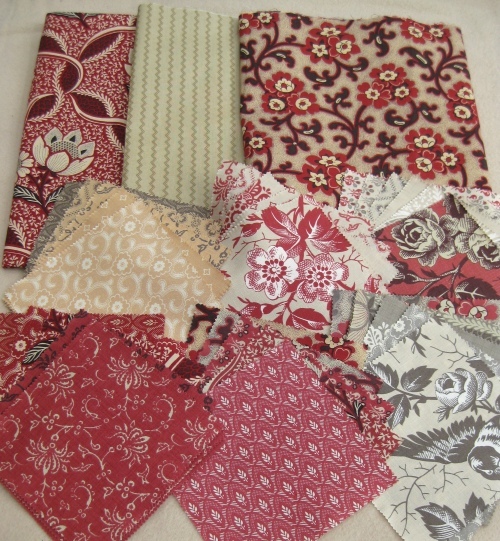 I’ve chosen some gorgeous fabrics in shades of red, cream and brown, from a range called Chateau Rouge by Moda Fabrics. 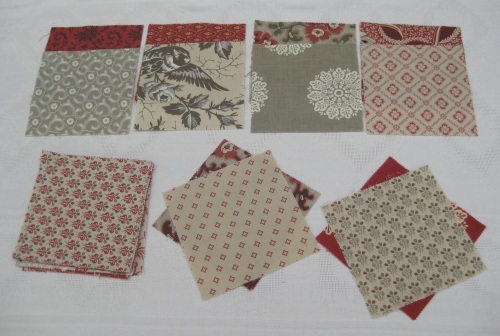 I bought a charm pack (a pack of about forty 5 x 5 inch squares, in many toning shades), and two separate yards of fabric – one for the wide border, and one for the backing. I’ve sorted the fabrics from the charm pack into toning pairs, so that each block will have very obvious differences between the L-shaped pieces, and the ‘background’ surrounding them. The next job is to cut everything out! 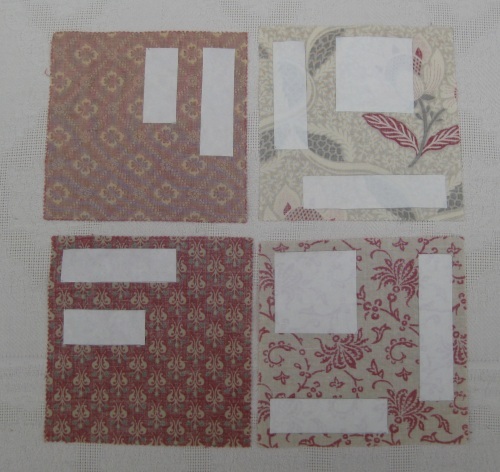 Back in June, I posted about this quick project that I’d started – it’s called a ‘cheater quilt’, as the fabric is already printed with the patchwork-style blocks on it, so I didn’t have to piece all those tiny shapes together! 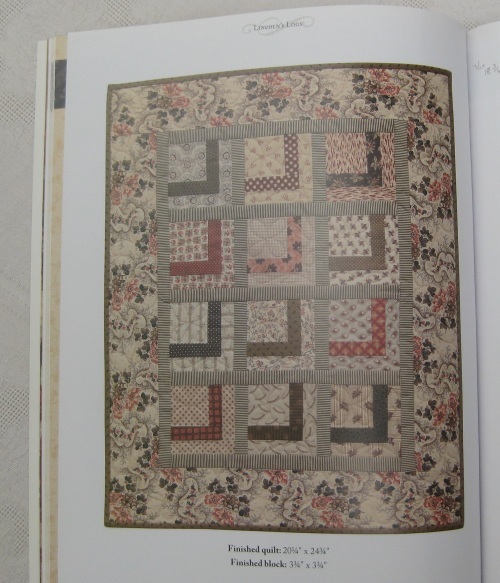 I just wanted a simple hand quilting project that would be portable, to see me over a few weeks of the summer while I was travelling about. 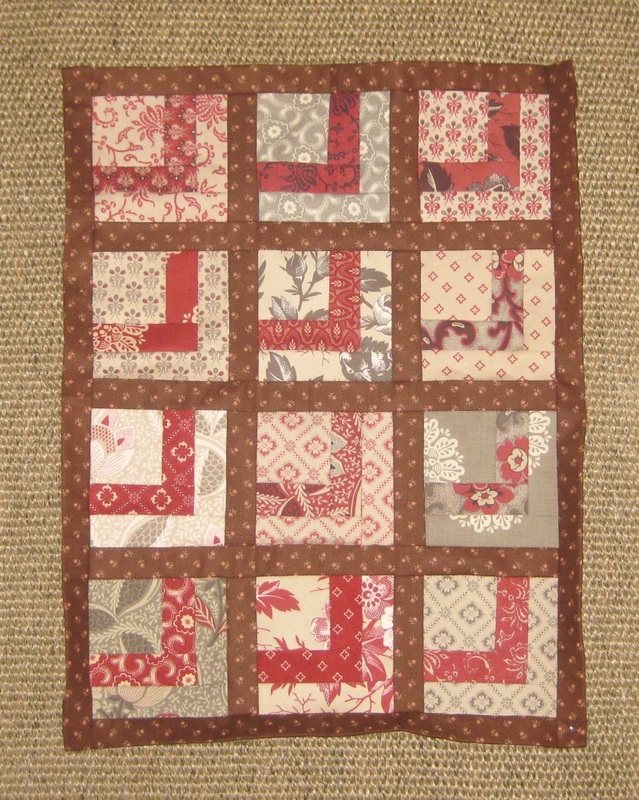 So, the quilting itself was completed after about a month. 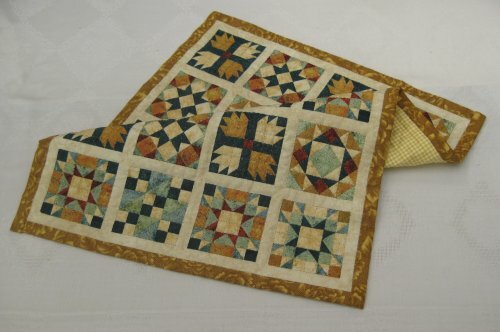 Very easy to do – I just did running stitch around the edges and inner patterns of all the printed blocks, and stitched little squares in the intersections of the blocks, to hold the fabric down nicely. Then I did the binding, using a long quarter of a fabric I’ve had in my stash for years, which I bought from the Cotton Patch shop in Birmingham. 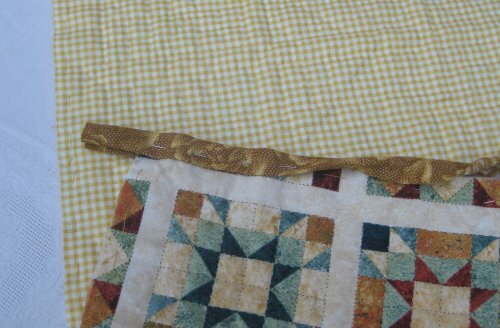 I used two inch wide strips, and pinned the strip to the reverse side of the quilt, flush with the edge, with right sides together. 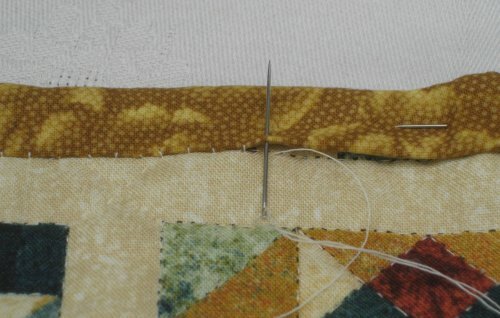 Then I handstitched the strip in place from the front side of the quilt, half an inch in from the edge. I folded over the strip to the front, making a hem, and pinned it in place, then slip stitched it into position. Then I did the same on the opposite side of the quilt, so both long sides were completed first. To neatly bind the two shorter sides, I pinned the strips in place in the same way as before, but first I had to turn back a half inch hem at the start and end of the strip, so that the corners would be neat. This is how it looked sideways on. After stitching half an inch in to attach the strip, as before, I slip stitched the binding in place. This is the finished cheater quilt – it measures about 22 inches by 16 – not very large, but quite impressive considering I didn’t actually do any real patchwork for this!! I love the checked backing fabric – it goes really well with the colourway of the front. 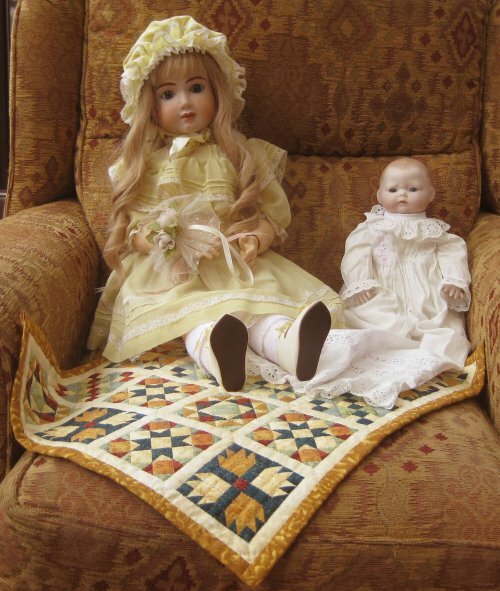 And this is what I made it for – I have some reproduction dolls that usually sit on the first floor landing in my home, and I decided to make them some mini quilts to sit on (actually, I wanted to make some mini quilts and couldn’t think what on earth to do with them, so that was the best ‘reason’ I could come up with! ).